In line with one of UTAR’s pillars of education, namely Physical and Mental Health, UTAR has been encouraging its students to participate in sports and other co-curricular activities in order to inculcate interest and creativity, as well as to enhance leadership and management skills. This round, UTAR Kampar Campus contingent achieved another exceptional feat in winning a total of nine medals — three gold, two silver, and four bronze — in the annual Kejohanan Masiswa Zon Utara 2016 that was held at the Tunku Abdul Rahman University College (TAR UC) Sports Complex in Penang from 26 February to 29 February 2016. The nine medal haul placed UTAR in second position in the overall rankings. Organised by TAR UC Penang in collaboration with the Ministry of Education (MOE) and Majlis Sukan IPTS Malaysia (MASISWA), the tournament was aimed at encouraging students’ participation in co-curricular activities. The tournament saw more than 700 student athletes from a total of 15 institutions of higher learning in the Northern Zone, competing against one another for the championship title. These participating institutions included UTAR, Universiti Teknologi Petronas, TAR UC Penang, TAR UC Perak, Universiti Kuala Lumpur, Quest International University Perak, INTI International University Penang, SEGI University Penang, Kolej Poly-Tech Ipoh, Kolej Poly-Tech Alor Setar, Sentral College Penang, KDU University College Penang, Stratford University Penang, Wawasan Open University Penang, and Kolej Profesional Mara Seri Iskandar. UTAR Department of Students Affairs, Sports and Recreation Unit Assistant Manager S. Theva Das led the contingent of 46 students. 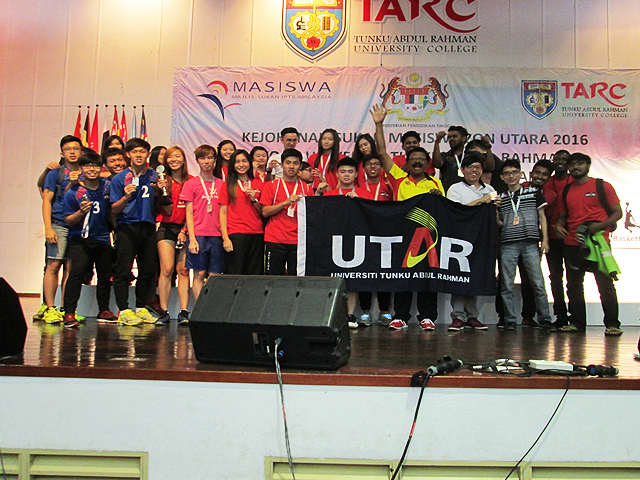 Volleyball, futsal, chess, badminton, ten pin bowling, table tennis, netball, and basketball were the games played and UTAR participated in four of them. The three golds were from women’s volleyball, badminton mixed double pair, and the first team in badminton women’s double pair. The badminton players who contributed the two golds were Marketing student Jason Loo Koon Seng and Accounting student Goh Sueki in the mixed double pair event, and Banking and Finance student Lee Xue Qi and Goh again as the women’s double pair players. The two silver medals came from the first team in the badminton men’s double pair and the men’s volleyball event. Three bronze medals came from the badminton players in the second team in women’s double pair, the second team in men’s double pair, and men’s single events. While the remainder came from the men’s single event in chess.